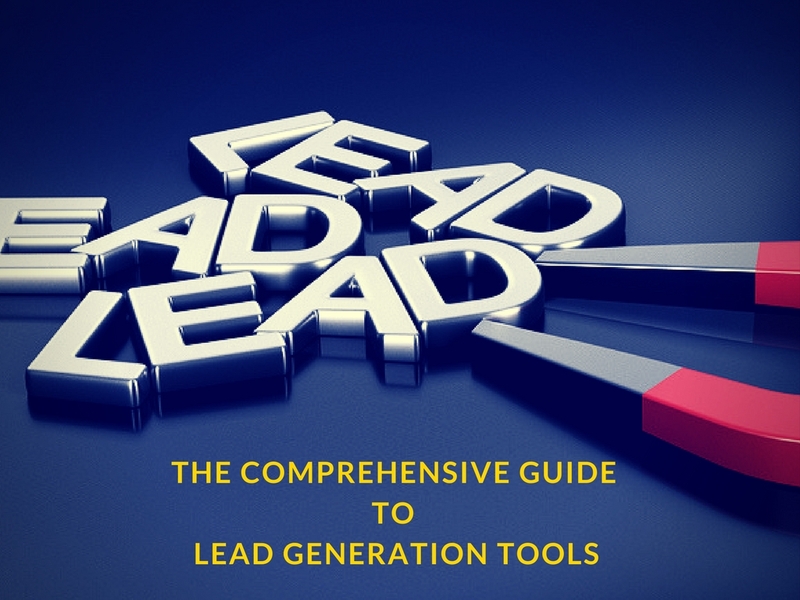 What are lead generation tools and do you need them? How do they work? How about costs? But, instead, not a single person shows up to download it. The reality is that it can be super difficult to generate high-quality leads consistently…even if your lead offer is smoking hot. Full-scale, ROI-boosting lead generation is a lot more time and labor-intensive than simply publishing a shiny new landing page and sending it out into the internet. In fact, generating high-quality leads is a top challenge for 61% of B2B marketers. BUT…You need leads to grow your business. You need leads to survive and thrive. You need leads to sell your high-end products. You need leads to…well, you get it. And, you know exactly how valuable a consistent stream of qualified leads are for your expanding organization. But, to acquire a high number of these leads and continue to scale this thing, it takes a lot of time, and let’s face it…it’s just plain difficult to do so consistently. However, 80% of B2B marketers rate “generating quality leads” as the marketing technique with the highest profit potential. It’s essential! So how do you generate leads faster, easier and more efficiently? Lead generation tools are software-based programs and applications that assist businesses with the complex, often tedious process of lead generation, and help them to, well, just plain get more! Leads can be anything from an email subscriber who just took advantage of your lead offer to a person you found on LinkedIn who you know would be interested in your services, and everything in between. Are Lead Generation Tools for You? Does your business collect personal information from people who could potentially become purchasers of your products and services? Do you want to cut down on manual labor and laborious research and invest this time back into money-making processes? If so, you may need a lead generation tool. B2C (business-to-consumer) companies sell directly to consumers and they typically have short sales cycles. This means that once they get a lead, the sale often comes a short time after. Lead generation tools can help automate the process of gathering these leads and make acquiring sales seamless and easier. B2B (business-to-business) companies generate leads and nurture them until they buy. The sales cycles are typically longer and require more communication and relationship building than a B2C company. Sometimes, more than one decision maker is involved in purchases, which also lengthens the sales cycle duration. Lead generation tools will be advantageous to B2B companies because some include lead management and customer relationship management which is crucial to landing a sale once a lead is acquired. Just about any B2B company (SaaS providers, membership sites, digital product business, anyone taking advantage of content marketing) can benefit from lead generation tools. If you are gathering interested people on to some sort of list or database in an effort to sell to them later, you are generating leads. If your sales cycle is longer and you need to nurture leads, there are tools to assist with this level of customer relationship management as well. As we go through the different lead generation tool categories later in this guide, I will specify whether or not a specific tool will be valuable to a B2C or B2B company. Some may not be worth your money investment. Imagine if you could press a shiny green button on your clothes washer, walk away, and when you return, your clothes are not only washed and dried but wrinkle-free and folded neatly in your drawers. Okay, maybe you would look at me strange if you saw your laundry wash and fold itself, but the point is that automation is a time-saver. Today’s marketers need ways to generate large numbers of top-quality leads and to convert them at high rates, without sacrificing a lot of time and resources. Lead generation tools can help with this. These strategies may involve a lot of manual manpower, time and resources to accomplish fully. However, this time and effort can limit your growth potential and place a cap on your earnings. One way to break this cycle is to take advantage of marketing automation in the form of lead generation tools. In a VB insight study, 80% of people who took advantage of marketing automation saw their number of leads increase and 77% saw the number of conversions increase. Lead generation tools work by automating or speeding up the time it takes you to find, attract and manage leads, making your lead generation campaigns more efficient and effective. For example, some lead generation tools can monitor your website visitors’ activity on your site so you can more effectively target and attract them, a task you would not be able to execute normally. This can also bring in a greater number of leads you would have otherwise missed. Found a potential lead but don’t know how to contact him/her? Instead of scouring the web looking for contact information, use lead generation tools to search, giving you automatic results in seconds. Maybe you are trying to gather leads onto your email list and you want to start with a high-converting landing page instead of hiring a designer and a developer and then split testing several manually. Lead generation tools can help with this too. We will give you some more lead generation tool examples below but these are just a few of the ways these tools work. 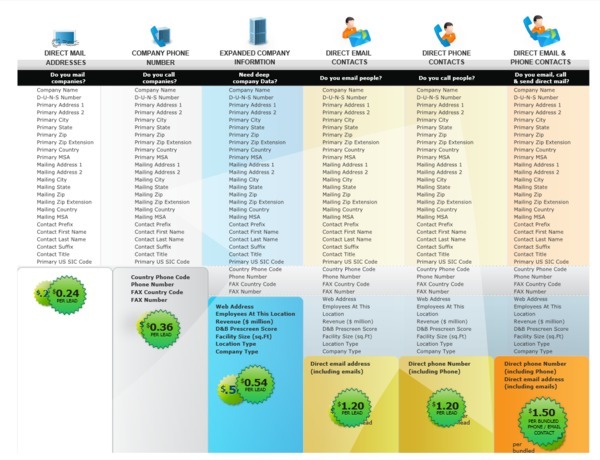 Lead generation tools vary in price depending on the complexity and the category. Some tools cost as little as dollars a month while others will run into the thousands. I’ll discuss pricing below for many popular tools, but when contemplating the prices, consider what you will save in time and labor when implementing these tools. Many also have free trials so you can get an idea of how they work and give them a test drive. Below are some popular lead generation tools on the market. They fall into different categories depending on their function and what features they offer. Lead databases allow companies to gather legally sourced and verified targeted leads for their industry from a large database. Some databases also have contact features so you can message the lead directly from the platform and also manage the nurturing process. These tools below are best suited for B2B companies. Limeleads is a B2B lead database platform that allows you to search for leads by position and industry and access their contact information. It offers leads in industries such as advertising, retail stores, medical professionals, schools, construction professionals and more. Here is a 30-second video of how Limeleads can help you find targeted leads. 1. Pay as you go (per lead). Leads start at 0.48 each and decrease in price the more quantity you purchase. 2. Pay monthly – If your business gathers leads ongoing, it may be advantageous for you to select a monthly plan. Paying monthly saves you from 46 – 60% on the pay-as-you-go plan. The monthly plans start at $499 per month for 2,000 contacts. Formerly Avention, D&B Hoovers is another B2B lead database providing businesses detailed company and personal information. Search its database of 100 million contacts and uncover information such as company history, competitors, financials, and more, as well as personal details such as titles, job history, contact information and more. In addition, research industry information and trends and financials on more than 1,000 industry segments. Besides generating leads, sales teams use this data to study up on leads and better prepare for sales calls, improving close rates. 1. Pay per list: Pricing starts at $0.24 a contact for company mailing addresses only and caps at $1.50 per lead for more robust information including emails and direct phone numbers. 2. Subscription – Hoovers offers three subscription models with a free trial option. Subscription prices are not listed on the website. Unomy features a B2B lead database and a slew of other tools to help businesses find and dig deep into their contacts’ data. In addition to lead generation, the tool also enriches your existing leads with pertinent information you can use to close more deals. Other features include B2B prospecting capabilities and Salesforce integration. Pricing is not listed on the website. You need to book a demonstration to discuss pricing details with a team member. On-site communication tools run on your website and allow you to interact with visitors. These leads are more targeted because you can tailor your messages to the page they are visiting or how much time they spent on a particular page. These tools are valuable for both B2C and B2B companies that want to capture a potential lead or customer in real-time and start a conversation or answer a question. Intercom Intercom offers multiple solutions for businesses named Respond, Engage and Educate. The live chat feature is a combination of Respond and Engage and it allows you to message customers in real-time (Respond) and also Engage by sending them future emails to nurture them into becoming a customer. Businesses can set up Intercom messages on individual pages to prompt for questions and offer advice. For example, Intercom set up a real-time message while I was browsing its Live chat page. See how the message prompts me to consider switching from one of its competitors. Live chat starts at $53 / month with a 14-day free trial. There are additional costs if you want to add the Educate feature which is a customer service solution. Qualaroo allows you to target people at different stages of the sales process. Get insights on people who may convert to a lead who would have otherwise left your site without converting. Ask website visitors’ questions about your website and gather data to improve conversions and sales. Target surveys by how long a visitor is on your page, how often they visited, what they searched to arrive on that page and more custom variables. Qualaroo offers three monthly packages, starting at $199/mo billed annually and $249/mo billed quarterly. How many people visit your site that could have become leads? These lead generation tools monitor people on your site who could become leads but may have never filled out your forms nor contacted you. Some tools also include features enabling you to contact potential leads. This tool enables you to capture the company information or affiliation of the people who visit your website but do not become leads. Also, get access to what content these people viewed and how to contact them. 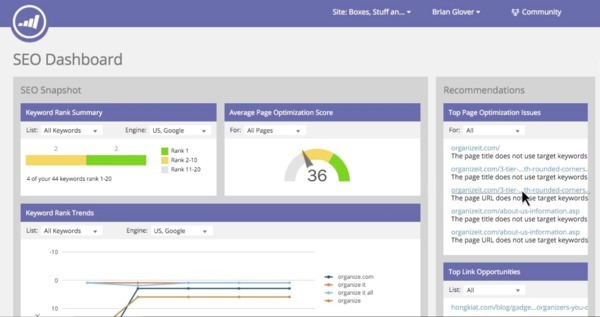 Use LeadForensics to find the companies who may be monitoring your website content. Are any users visiting your contact form but not filling it out? This could be a sign of interested potential leads. User feedback: Twenty-five reviewers on G2 Crowd gave LeadForensics an average of 3.2 out of 5 stars. Though many liked LeadForensics and its filtering and sorting capabilities, one negative point users mentioned was that the tool does not supply the exact contact information of the person visiting your site, just the company profile. Other users felt this was not a big deal as you could still find contact information from the company in question using other methods. Pricing is not listed on the website but the company offers a free trial with sign up. 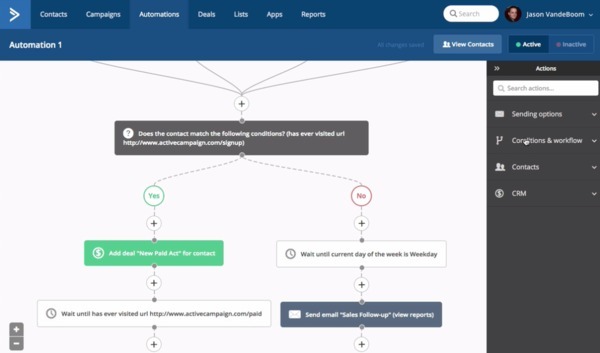 ActiveCampaign is an email service that enables you to track a user’s interaction on your website and then make these triggers for your email campaigns. The tool also houses robust features such as CRM (customer relationship management) capabilities with lead nurturing and scoring, contact segmentation, multiple integrations and more. Monitor your users’ activity and initiate contact when a lead visits a specific website page. For example, create a segment of leads who visit your pricing page and clicked to “buy,” but did not go through with the purchase. Send these cold leads messages to convert them into warm leads. Gertrude also mentioned one con was that even though she has a paid plan, the ActiveCampaign logo still appears on her web forms. You need to upgrade to a higher plan to get the logo removed. ActiveCampaign offers four monthly plans starting at $9/month for 500 contacts. The pricing is based on a sliding scale with price changes as the number of contacts increase. To get the logo removed, you need the Plus plan. 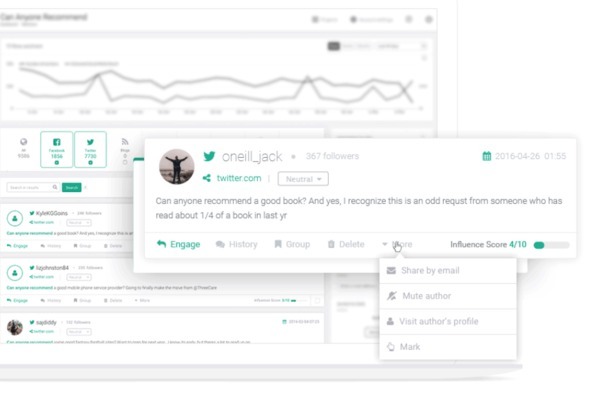 Brand24 is a social monitoring tool that tracks social web mentions of your brand in real-time. It also offers features such as influencer score to help you identify influencers in your industry, sentiment analysis to segment mentions (positive, negative, neutral), reply in real time functionality, track competitor mentions and more. User Feedback: Out of 102 reviews, Brand24 received 4.7 out of 5 stars. Users loved the power of the brand mentions. A few said they had a difficult time setting up their campaigns, but the majority of the reviews were positive. Monthly packages start at $49 / month with a 14-day free trial. If you use sites like LinkedIn and Google to dig and find prospects, the following tools will be valuable to you. The tools are more suited for B2B since these are the companies that would primarily use LinkedIn. Found.ly is an all-in-one sales prospecting tool which is great for small startups all the way through to large corporate companies. With Found.ly you can efficiently manage your sales prospecting process without the need for a sales stack. Perform your email prospecting directly from their chrome extension or simply import your data. 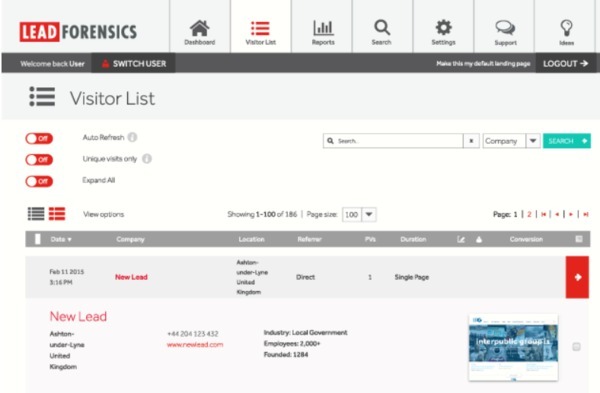 Manage your prospects within ‘Lists’ (folders) within your Found.ly dashboard, and stay organized with activity. Set up your email cadences and simply integrate with your Gmail account to reach out to these contacts. You can also manage all of your analytical reporting within your Found.ly dashboard while simply managing your responses directly from within your Gmail inbox. Pricing starts at $49 per month. 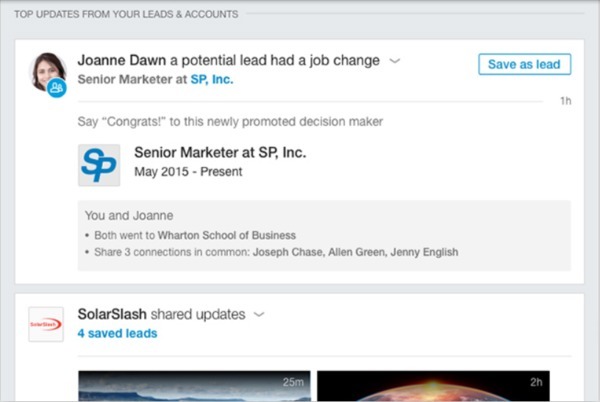 Organize and build lead lists of potential leads you find on Linkedin with its advanced search filters. Contact them automatically without needing to be a connection. Get real-time insights on prospects you are watching and see who has viewed your profile in the last 90 days. Salesforce integration is also available. User feedback: Reviewers on G2Crowd gave LinkedIn Sales Navigator 4.0 out of 5 stars on average. Most liked the tool to organize and find leads. One commonly noted con is that the tool doesn’t offer the phone numbers nor emails of the lead. You need to use another prospecting tool to acquire that information. There is also a limit to how many INmails you can send monthly. 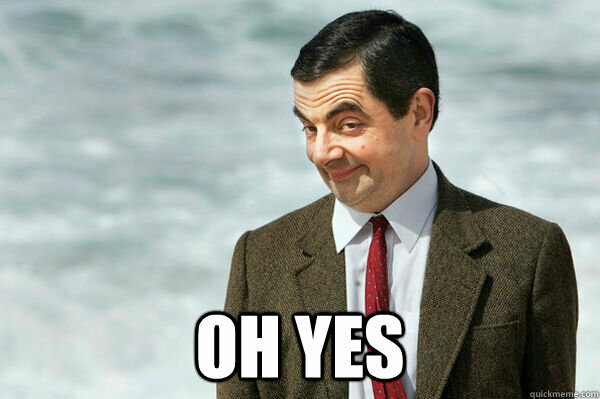 LinkedIn Sales offers a one month free trial. Packages start at $64.99 monthly thereafter with discounts for yearly pricing. LeadFuze is a B2B tool that helps you find and qualify targeted leads. It also gives you double-verified email addresses and phone numbers for each lead and automates outreach. Analytics and split testing features are also included along with integration with the most popular CRMs such as Hubspot, Salesforce and Pipedrive. User feedback: Capterra reviewers give LeadFuze 4.5 out of 5 stars out of 14 reviews. Most were positive with only a couple mentioning a con because they found the tool a little difficult to set up. Overall, reviews were very positive. Pricing starts at $299 / month with a free trial. You also get 25 leads for free. Marketing automation platforms help businesses capture, nurture, score and manage leads all the way through the sale process. These tools also cater to both B2B and B2C companies. Hubspot Marketing is the lead generation component of the Hubspot Growth Stack. It helps you attract targeted traffic with professional landing pages, blog and email templates. It also offers SEO, blogging and social media tools as well as email and marketing automation. 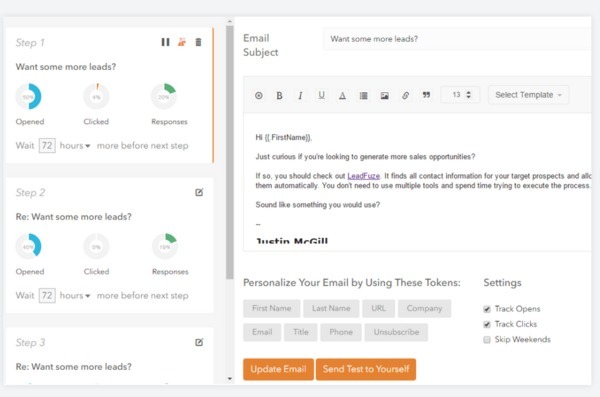 Hubspot Sales is a lead management and messaging platform that enables you to follow your leads’ activity, whether they opened your email or downloaded your attachment and more, while informing you of which emails performed the best. 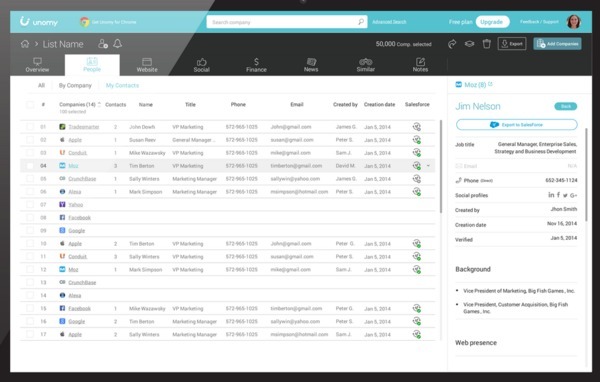 It also integrates with Hubspot CRM and Salesforce. HubSpot CRM helps you organize, track, and nurture your leads and customers. You can manage your entire pipeline, sort deals, schedule appointments, track performance and more. User feedback: The average rating for Hubspot on softwareadvice.com is 4.5 out of 5 stars with high remarks across the board. Some cons mentioned were the lock-in contracts and the learning curve with getting acclimated with the software. Hubspot Marketing – Packages start at $200 / month with a $600 required onboarding fee. 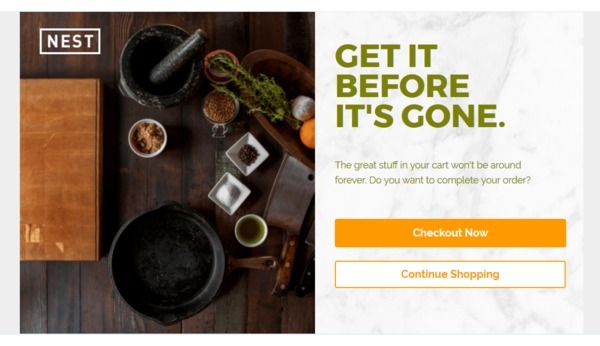 Hubspot Sales – Free plan available with limited access (5 email templates and 15 minutes of calling). Upgraded version is $50 / user / month. Hubspot CRM – Free with unlimited users. However, if you use HubSpot CRM with HubSpot’s marketing tools, the contacts you add to the CRM end up in both places, and could affect your Contact tier pricing. Marketo is another marketing automation tool similar to Hubspot, however, Marketo positions itself as more of a lead management tool. Marketo does not include an internal CRM, but it integrates with many of the top CRM platforms. Marketo focuses more on the mid-to-enterprise level business. Features include lead generation and management, email marketing, consumer marketing, customer base marketing and mobile marketing. Check out this article to see the major differences between Hubspot and Marketo. User feedback: Marketo received a 4.0 out of 5 stars on softwareadvice.com. Reviewers mentioned its flexibility, power and numerous integrations. Cons mentioned were a steep learning curve and issues with customer support. Pricing is not listed on the website. Each features has its own set of packages. Review sites have listed prices anywhere from $800 – $3,200 a month. VipeCloud is not an all-in-one similar as large as Hubspot, but it continues to build out its platform and add new features. It’s main features include email marketing and social media automation, but it has also built out a robust CRM. This tool could be a low-priced option for startups who are more mindful of costs but want the automation an all-in-one tool provides. User Feedback: The tool received 10 reviews on G2 Crowd at 4.7 out of 5.0 stars. According to Jim of Boulder-based recruiting firm, HireEducation, his organization uses VipeCloud primarily as a means of mass emailing, allowing them to communicate with customers more often and more efficiently and also get themselves in front of a greater number of prospects. Pricing starts at $30/user/month billed annually or $100/user/quarter. VIpeCloud also offers a 15-day free trial. These tools provide lead generation forms and landing page templates, allowing businesses to work with professional, high-converting forms without the need for a designer and developer. These tools are also valuable for both B2C and B2B companies, essentially any business that uses forms and landing pages in their marketing. LeadPages is a popular landing page and form builder that offers high-converting templates ready to customize. Templates include opt-in, sales pages, webinar registration, upsell pages, product launches and more. The tool also offers split testing and multiple CRM integrations. LeadPages also offers LeadBoxes, a two-step opt-in forms feature allowing you to capture leads directly with lead capture popups. User feedback: On G2 Crowd, LeadPages received 4.3 out of 5 stars with 53 reviewers. Overall, the feedback was positive, although a few reviewers mentioned some templates can be tricky to customize and the templates are not as customizable as they would like. New features can get glitchy with rollouts. Pricing starts at $37 / month with discounts for annual and 2-year billing. A 14-day free trial is also offered. Unbounce is another lead generation tool that offers numerous landing page templates to help businesses capture new leads as well as overlay forms (smaller popup-like forms that hover over your website pages). Similar to LeadPages, Unbounce offers an easy-to-use page builder with split testing capabilities. There are some differences between Unbounce and LeadPages, however. You can read about them here. 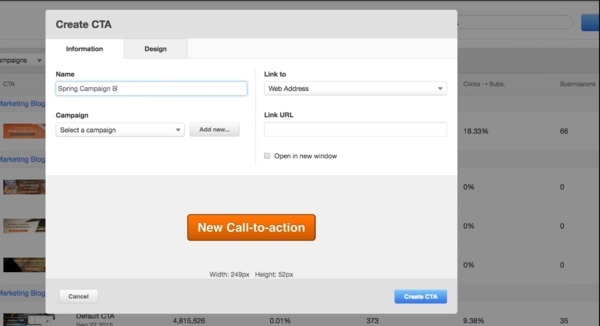 Example of an overlay form template in Unbounce. User feedback: On G2 Crowd, Unbounce received 4.3 out of 5 stars from 68 reviewers. They liked its ease of use and robust selection of templates. One con mentioned was issues with mobile view and implementing mobile responsive pages. Monthly plans start at $99 / month with a 20% off discount for annual subscriptions. Picreel offers lead capture templates, but in the form of exit intent overlays. This software allows you to show an overlay once a visitor hovers over the close button on your web page, enabling you to capture more leads. There are numerous overlay templates to choose from with customizable options available as well as split testing capabilities. An example of a full page overlay. This will cover the entire web page once users hover to exit. User feedback: Eighty-two reviewers on Capterra gave Picreel 5 out of 5 stars. Many praised the tool for helping them increase their lead generation rate and also keep people on their sites longer. I use Picreel with one of my clients and I personally have witnessed how powerful this tool can be. Last month alone, my client was able to secure an extra 1,839 leads on to his email list using Picreel. Monthly packages start at $19 / month with a 25% discount if purchased annually. A 30-day free trial is also offered on all packages. So you’ve got the tools you need to generate leads, now, how will you measure success? Leads are great, but leads that convert are even better. We invite you to check The Definitive Checklist for Conversion Optimization and its included Free Benchmark Report on Conversion Optimization. What’s a good conversion rate? 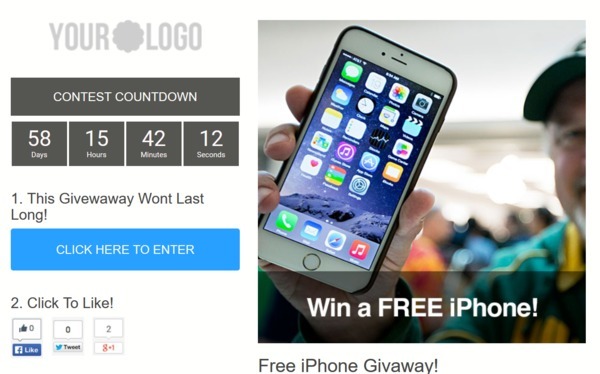 How many conversions should Facebook ads generate? These questions and more are answered in detail and will help you see how you’re doing. And if you’d like more help with your content and driving quality leads to your front door, we invite you to start a free trial today!